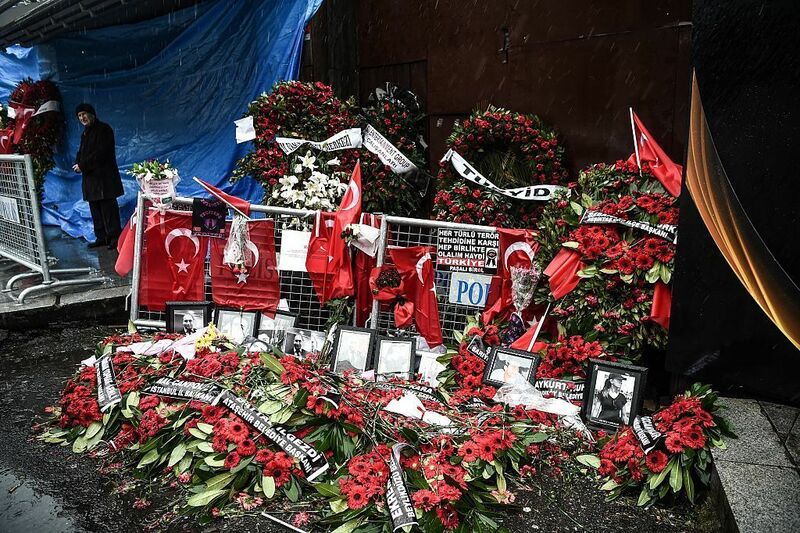 Turkey Arrests 'Main Suspect' From New Year's Day Attack On Instanbul Nightclub, State Media Say : The Two-Way Police have taken at least 16 other people into custody in connection to the deadly attack, which killed at least 39 people. A gunman shot his way into the club packed with holiday revelers. Flowers and pictures of victims have been laid in front of the Reina nightclub earlier this month after the deadly attack. Turkish police have arrested the "main suspect" from an attack on an Istanbul nightclub on New Year's Day that killed at least 39 people, according to the state-run Anadolu news agency. Officials have not publicly named the suspect. The arrest happened late Monday during a police raid in the Esenyurt neighborhood of Istanbul, Anadolu reported. Police have taken at least 16 other people into custody in connection to the deadly attack. It happened in the early hours of the morning on Jan. 1, when the gunman shot his way into the packed Reina nightclub. Turkish authorities also previously "released a 'selfie' video purportedly showing the gunman walking along a city street," as The Two-Way has reported. "Turkish authorities did not say when the video was recorded or how they obtained it." ISIS has claimed responsibility for the attack, prompting Turkey to vow to intensify military attacks against ISIS targets in Syria.